1. Mainly used to weld kinds of flange and heating tube. 2. High frequency welding, high efficiency, little pollution, stable quality, safety. 3. PLC automatically controlled, easy to operate. 4. Easy to fix the elements, change the specifications and maintain. 5. 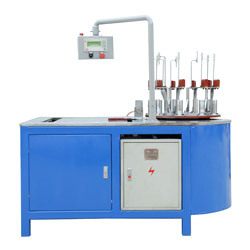 Kinds of high frequency, flame, argon-arc welding special machines can be custom-made. 1. Power supply: triphase 380V, 50Hz, 22.5KW. 2. Heating mode: high frequency. 3. Welding positions NO. : six. 4. Size (L x W x H): 1650 x 1100 x 1650(mm).